An enthralling contest, however, was sadly marred by the sight of numerous pyrotechnics, while a coconut was also thrown on to the pitch. 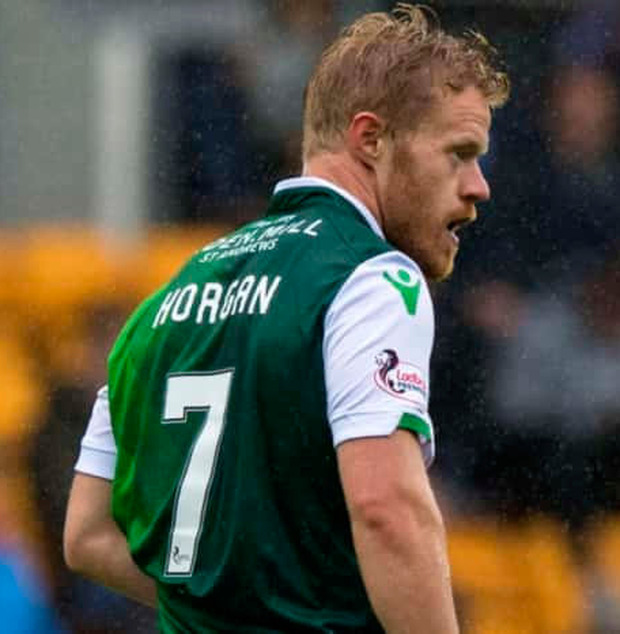 Republic of Ireland international Daryl Horgan emerged as Hibs' hero with a brace either side of the break to cancel out Peter Haring's seventh goal of the season. The result allowed the visitors to leapfrog Hearts into fifth in the Premiership standings, two points clear of the Jambos. Hearts will rue a host of missed chances, including Olly Lee striking the woodwork in the first half and Arnaud Djoum spurning two golden opportunities. That will be of no concern to Hibs head coach Paul Heckingbottom who, fresh from claiming Premiership manager of the month for March, has collected 20 league points from a possible 24 since succeeding Neil Lennon. Prior to Haring's 25th-minute opener, Hearts should have taken the lead eight minutes earlier when Lee rattled the post with a free-kick from the edge of the box. Jake Mulraney then forced a sharp low save from Ofir Marciano, before Djoum fizzed an effort over the bar after meeting a Lee delivery. Hearts deservedly grabbed the lead their early dominance merited when Haring out-jumped a flat-footed Mark Milligan to meet a Lee corner and power a point-blank header beyond the helpless Marciano. But with the home fans still celebrating, Hibs levelled within two minutes. Excellent work from Marc McNulty saw the Scotland international burst down the left flank and show fine awareness to tee up Horgan at the far post to slot home the equaliser. Hearts felt they should have had a spot-kick on the stroke of half-time when Stephane Omeonga appeared to have kicked John Souttar in the penalty area, but referee Willie Collum was unmoved by the defender's pleas. Ten minutes after the break Hibs completed their turnaround, with Horgan collecting a Stevie Mallan pass and unleashing a superb low drive beyond Zdenek Zlamal from the edge of the box for his eighth goal of the season. Hearts pushed forward in search of their own equaliser, with Djoum blasting wastefully over the crossbar after being left unmarked to a deep cross from Bobby Burns. A superb point-blank save from Zlamal was required to deny McNulty in injury-time after a swift counter-attack but it was not to prove costly for Hibs. The game was marred on occasion, though, by the moronic behaviour of a minority of individuals. Kick-off had to be slightly delayed by Collum after a pyrotechnic was thrown from the Hearts supporters in the Wheatfield Stand. Further smoke bombs were set off by both sets of fans after the first two goals, while a coconut appeared to be thrown from the away section prior to half-time.